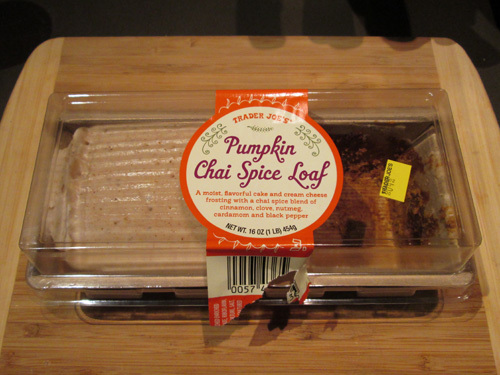 I saw this Pumpkin Chai Spice Loaf listed in the latest Frequent Flyer, and as a lover of all things Pumpkin and also all things Chai, I had to find it. I searched three different NYC stores before finally locating it at the new location that just opened a month or so ago on 3rd Ave & 32nd St. I got there just in time, too, because it was the very last one on the shelf! I opened it up as soon as I got home, while I was heating up lunch leftovers for dinner. I'm a big fan of sweets in general, so a cake with two of my favorite flavors was going to be hard to screw up for me, and TJ's did a great job on this one. 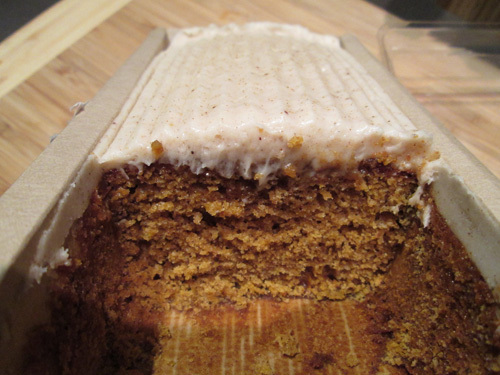 The cake itself is soft and moist, with a light pumpkin flavor that actually isn't all that sweet. The frosting is where the chai flavor comes in. It's got a nice warm flavor that also adds some sweetness to the cake. I generally like my sweets on the very-sweet side, but I really liked the subtle sweetness to this. I think pumpkin is one flavor where too much sweetness drowns out the pumpkin flavor, so this is a great balance. I'll definitely be picking up another one of these (if I can ever find them again).